They had lost just three league games in what has been described as a “fairytale” and the “most unlikely triumph in the history of team sport”. 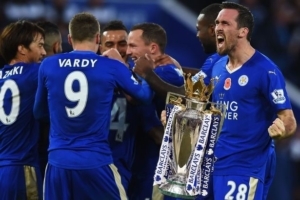 Closest challengers Tottenham Hotspur, Arsenal, Manchester City, Manchester United and last year’s champions Chelsea, have all failed to match the Foxes’ consistency across the season. Come on, just how good is this? It is a wonderful achievement and we feel – as a company – that we have an awful lot in common with an admirable establishment like this. Well, Delta’s management believes in building strong relationships with clients, satisfying future needs and providing ultimate solutions. Our products not only meet, but exceed Civil and Federal Aviation Authority requirements – which is in strong comparison with the Foxes. They have built relationships they never had, satisfied people past their wildest dreams and provided the highest quality ‘product’ all season! You can see where I am coming from can’t you? Well, Vardy ticks every single element of this – he’s provided consistent high quality, he has been unbelievably cost effective (understatement of the century) and has offered much more than you could ever imagine! News like this is refreshing, awe inspiring and gives us all hope. It shows that when you feel that deal won’t come off, will that actually be the case? “When you consider who they had to take on in Manchester City, Manchester United, Arsenal, Chelsea, Liverpool and Tottenham and the vast sums of money these clubs have spent on players and managers, it’s just one hell of a story. It’s certainly the biggest and best story I have ever seen in all my time in sport.” This was all on a Coral blog by Shearer. Stories like this are wonderful and show us all that – when you apply the right attitude and ethic – that you can not only achieve, but exceed all expectations. We, as a company, will always apply this method…… to Leicester City!